Over the course of a fifteen-year recording career, The Tragically Hip have racked up both a singular body of music and an impressive array of career accomplishments. Their long association with Universal Music Canada (then MCA) began in 1988. Since then, the band have issued eight albums, collectively selling in excess of 5 million copies in Canada alone. 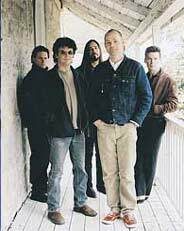 The group of five longtime friends (Gord Downie - vocals, Gord Sinclair - bass, Paul Langlois - rhythm guitar, Rob Baker - lead guitar, Johnny Fay - drums) from Kingston, Ontario formed in 1986. Music @ Work is their 9th album. More than thirty songs in their oeuvre have reached Top 10 status at Canadian radio. The band have toured Europe with The Rolling Stones, and traversed the U.S. with Jimmy Page and Robert Plant. TheyÂ’ve appeared as musical guests on Saturday Night Live, and played the Saturday main stage at the 1999 Woodstock festival. In the U.S., The Tragically Hip have sold over a million records. Their remarkably loyal fans frequently travel hundreds of miles all over North America to follow The Hip (as theyÂ’re known to devotees) from city to city. The music thatÂ’s engendered such singular devotion is an infectious melding of melody, rockist energy and lyrical insight. The 14-song album Â– which the band co-produced with Los Lobos member Steve Berlin, with whom they first worked on the 1998 album Phantom Power - showcases the fivesomeÂ’s trademark blend of effortless songcraft, organic instrumental innovation and artful lyrical vision on band-penned songs link Â“My Music At WorkÂ”, Â“Putting DownÂ”, Â“The BastardÂ” and Â“Tiger The LionÂ”. The latter number Â– which frontman and principal lyricist Gordon Downie calls Â“the most audacious thing weÂ’ve ever doneÂ”-is an expansive epic that takes the group into excitingly uncharted musical and lyrical territory. Elsewhere, Julie Doiron, formerly of the noted indie combo EricÂ’s Trip, adds vocal harmonies to Â“The CompletistsÂ”, Â“Toronto #4Â” and the haunting album-closer Â“As I Wind Down The PinesÂ”. Over the course of its career, The Tragically Hip has forged the sort of potent creative chemistry that can only be achieved through time and experience. Â“WeÂ’ve always felt that the strength of the group is that it is a group,Â” says bassist Gord Sinclair, Â“and itÂ’s increasingly rare that bands are given the time to develop the kind of working relationship that we have. ThatÂ’s allowed us to create an atmosphere where all five guys can feel like they have an equal voice in whatÂ’s going down, rather than relying on one or two songwriters, and that allows us to avoid repeating ourselves.